You are here: Home / News / Real Men? Black America Needs To Call Out Our So-Called Leaders!! Real Men? 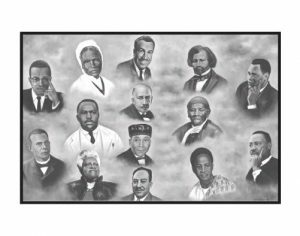 Black America Needs To Call Out Our So-Called Leaders!! (ThyBlackMan.com) I can publicly declare without a single reservation that Chinua Achebe’s Things Fall Apart is one of my favorite books of all-time. For those who have somehow managed to deny themselves the pleasure of Achebe’s writing, Things Fall Apart revolves around that horrific transition from independence to colonization for the eastern Nigerian Igbo community of Umuofia. Achebe provides readers with a riveting account of how Europeans missionaries introduced their Christian God to Africans and began an extended process that would not cease until the African was colonized. There is little room to debate against the common belief that this moment is the most horrific one humankind has ever experienced. Achebe’s story is set at the beginning of what will eventually become a centuries-long African Holocaust; this moment would make other Holocausts appear mundane. Achebe’s story revolves around the protagonist Okonkwo, a leader in the Igbo community of Umuofia, a figure who is the personification of physical strength and courage. One could never overstate Okonkwo’s importance as a leader. Although he had yet to rise to the level of an elder within Umuofia, Okonkwo’s influence is displayed during moments when the people of Umuofia needed to negotiate with outsiders; it was the imposing Okonkwo who was dispatched to handle business with outsiders. When a daughter of the village was killed by a neighboring group, village elders sent Okonkwo to discuss reparations regarding the death. I am sure that the sight of Okonkwo appearing over the horizon struck fear in other clans. Over the course of the riveting story where all Things Fall Apart, the African would see his Gods taken away, his land seized, and his glorious history permanently vanquished from memory. Unfortunately for the people of Umuofia, its citizenry, save Okonkwo, never realized that they were being subjected to a hostile takeover that would permanently alter their lives for eternity. I am left with similar questions after watching a cadre of black Pastors meet with Donald J. Trump. The alluded to so-called black leaders appeared to be 19th Century Minstrel show performers seeking to do nothing substantial. Instead of standing against Trump, a modern-day Pharaoh, the black pastors cowered and failed to represent Black America. Unfortunately for Black America, at a moment when rebuke and chastisement is the only sensible voice, black leaders choose to equivocate, compromise, and offer concessions to the very people who promise continued oppression and exploitation. Such matters leave me with little other than a dejected sigh that precedes Okonkwo’s lamentation of “where are the real men” during this disconcerting moment. Although I realize that there are still many reiterations of Okonkwo to be found in Black America at the present moment, however, there is little that they can do when those around them possess neither the courage nor the desire to resist the continuing attacks. What a sad time for Black America. To Trevo Craw: Your verbrose writings, which are oftentimes laden with cheap, hostile insults directed at dissenting commenters, not only allude to your insecurities when sharing your ideas with the general reading public, but also to your deficit in ability to think. Your thoughts are shallow, and your concerns are mostly with insignificant shadows on the walls inside of a very confining mental cave of your own making that is illuminated by the strong light of reason which shines beyond where you are psychologically chained. Your disrespect for the way in which we establish our leaders in America is profound in light of the fact that millions of fellow citizens who believe in our political systems afford you the freedom to sit,write, and try to disrespect these same liberty affording political systems.Your juvenile behaviors thus far remind me of a young man that I met on the streets of Newark, New Jersey who spent most of his time running from the law. This juvenile asked me to get off of his turf. I asked him if he owned this land ? He said “no.” I asked him if he had bought the cement that was used to pave the streets upon which I stood? He said “no.” I asked him if he had purchased the street lights that lit the pavement upon which I stood ? He said “no.” I asked him how does he figure that this is his turf ? The young man then pulled a switchblade knife out of his pocket, and slowly backed away. Your words are your knives, and you are starving for knowledge Trevo Craw. You do not seem to understand that you are kept by systems that provide you food, clothing and shelter despite your hostilities. You should stop playing with shadows on the walls inside your psychological cave born out of your fears of the unknown. Continue to educate yourself, and begin to respect our political systems and try to make real beneficial changes within these systems. Your existence as a free man living in the United States of America stands as factual proof of the power of our American political systems, and refutes your written misunderstandings of who you really are. Just as you do with your attempts to take down my articles, you have not been able to refute anything in this article, not one thing. Do you ever use facts, hard evidence and reality? You sound like you are straight off the plantation and on your way back. Our leaders are those who stand up, speak out and show up to fight for our rights, equality and against racism. Our government does not do that and you are apparently brainwashed into thinking that it does. The same people you refer to are those who follow the orders of special interest groups and corporations via lobbyists dropping tons of money their way. Votes in Congress are often bought and paid for. But since you don’t understand the nasty deception of politics, I suggest you go and watch The Distinguished Gentleman starring Eddie Murphy. Maybe it i simple enough for you to understand. We live in a Republic, not a democracy. Recite your pledge and see what it says. “And to the REPUBLIC….”. It has never been of the people, by the people and for the people. Slavery proved that. All the dead indigenous people are evidence as well. And racism confirms what I have just said. You sound really foolish and I suggest you sit down and be quiet because your Cointel Pro horns are showing. I tell the truth based on facts and evidence. You live in a Trumped up fake reality. Our leaders are the men and women who occupy the offices of the president of the United States of America, U.S. Congress, governors of our States, members of state legislatures, and members of local county, and city governments. We need to work with these elected leaders to help make America a better place for all of us.